Features targeted programs combining Chinese and Western medicine New treatments and therapies allow people with HIV/AIDS to live longer and live better. Now, the focus is shifting toward improving the quality of their lives and finding new ways to manage the often-debilitating symptoms of the diseases and related conditions. Misha Ruth Cohen, a noted specialist in the healing arts, here offers programs, combining the best of Chinese medicine and Western science, for treating digestive disorders, respiratory problems, diarrhea, skin problems, fatigue, pain, anemia, depression, and other maladies. She explains how to incorporate herbs, acupuncture, diet, nutritional supplements, stress reduction, and massage into a sensible comprehensive medical plan, which also addresses the spiritual, mental, and emotional needs of people with HIV/AIDS. 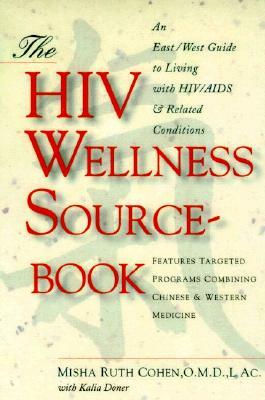 The HIV Wellness Sourcebook, the first book featuring such a multi-faceted approach, will empower readers to learn to coexist with HIV/AIDS and take control of their lives. Description: Light edge and cover wear. Unmarked pages. All Orders Shipped With Tracking And Delivery Confirmation Numbers.